Finally it’s Toio’s turn! Another divertissement signed by the Castiglioni brothers. Achille and Piergiacomo, also with Toio, had a lot of fun assembling already existing pieces, the famous “ready made”, giving life to one of the most iconic and desired floor lamps in the history of design. 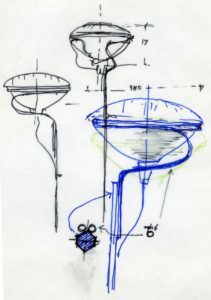 Designed in 1962, in that year it was so profitable for the production of the Castiglioni brothers, above all for the “light” objects, which saw the birth of the Gatto table lamp; the famous Arco, from the ground; the suspended Relemme; Taccia, the elegant table lamp and finally the Ventosa spotlight. So funny Toio already has the name, most probably a fancy name, the translation of the Eng-lish word “Toy” which means a plaything. 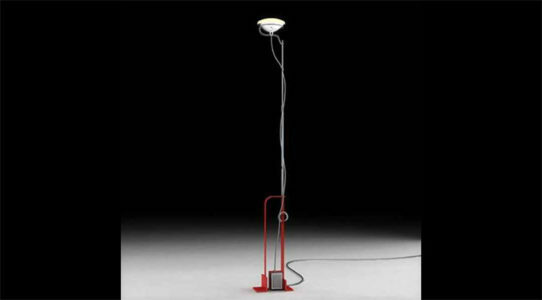 It is a lamp that, like other fruits of the Castiglioni genius, broke the rules by making important changes to new horizons. We mention the ready-made items, literally “already done” objects, that are everyday objects, common objects that we have under our eyes every day. They are resumed and distorted, re-designed to give them a new communicative role. And so, even in Toio, the constituent elements of the apparatus play a fundamental role, in fact they determine its shape. 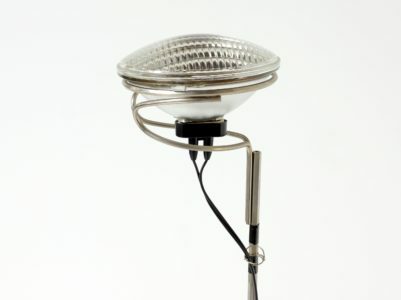 The luminaire is a 300-watt American automobile headlamp imported in the early 60s. The headlight is lean on a special frame consisting of two curved rods to which a metal ring is wel-ded. It is supported by a chromium-plated stem with an hexagonal section equipped with fishing rod loops (!) To contain the external electric cable. The height of the rod can be adjusted through a fixing screw on which there are also two slats that are used to wrap the residual ca-ble, to not leave it on the ground. 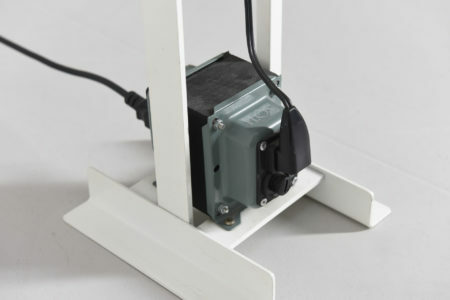 The base is in lacquered metal, possible in the black, red and white color and it contains the universal transformer, necessary to compensate the voltage difference between the light sour-ce (125 volt) and the European voltage (220 volts), left deliberately exposed and used also as a counterweight. 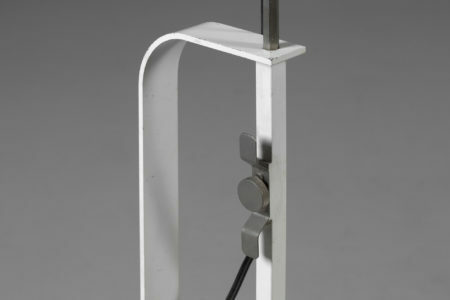 The base also acts as a handle with which you can move Toio in the desired environments. Yes it is! because Toio has a very strong character but at the same time is a-daptable to any environment without distorting its character but bringing the necessary plus to a quality environment. It is a lamp with indirect light, emits a beam of light that touches the wall until it reaches the ceiling, creating an attractive and relaxing light effect. Nothing is random or superfluous, everything is so perfect! Toio becomes almost indispensable! 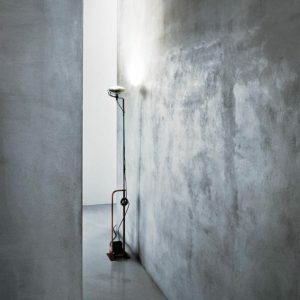 And it can only be produced by Flos, a synonym of high quality in the lighting project!